The subject of French Moult (FM) when raised at a club meeting is usually greeted with groans from some members of the audience who feel they have heard it all before. That’s true to an extent, but without trying to appear arrogant (that has been leveled at me before now!) there is a difference between being arrogant and being sure of oneself – hopefully. 2005 is my 60th season in budgerigars and I am still as keen as ever. I do not show a great deal these days mainly because I give more time to my wife who has supported me for decades, plus the fact that I gave my all to the hobby in the eighties with the start of BW and the BW Championships plus the start of The Budgerigar World Specialist and Rare Shows and The World Budgerigar Association. Yes, l did it all with help from my friends. All that ran into dreadful politics and when I needed support from so many, it wasn’t there. Now, today you see the reduction of the membership and as far as promoting the hobby to the general public, it is a non starter. If you don’t tell somebody about our existence, how on earth can you expect to recover the situation? It is no use at all preaching to the converted – that means you and me. Anyway, back to the FM subject. FM will appear certainly here at Tanglewood every year. Shocked are you? Ah, but let me qualify that. It appears right at the very end of the season with the odd chick that hasn’t been fed properly and no more than that. The final pairings are tired and they sense they have had enough, so feeding becomes a chore in a few nests. However it is never the sort of FM that, in addition to all flights dropping, the body is affected as well and the chick looks retarded. That I honestly say. What I do do, is to be very observant from May until I stop and I check all the flights and tails every day. lf I see a big headed chick around this time I also “play safe” and remove one tail feather. That is purely an insurance. If I find any flights affected at this time, the bird has every primary and secondary feather removed as well as the tail and I get the affected chick out on the cage floor immediately so that it starts to get better nutrition for the replacement feathers just removed. The new growth will be fine – provided your principal dietary input was super to start with!! You should have had a very good season by the time a few FM’s arrive at the very end. Let’s face it you can live with that by that time. Remember it is the longest feathers in the body that are affected starting with the tail. Big headed birds in the nest towards the end of the season are likely candidates (long feathers). Watch them very carefully. FM is like the cold virus in behaviour. Like a cold it doesn’t last. Taking out the flights etc clears the follicles which allows new growth to get through. This proves that the “FM virus” is a passing matter. So far I haven’t found a better technique to overcome FM problems but I do miss out when I am on holiday should any arrive. With good management practices success will be the reward — but that brings me back to not telling the public what a great hobby this is. To finish on a promotional note, if your editor will allow me, I have heard it said that because I don’t show today, I cannot have good quality stock. If you don’t know, the Moffat stud was willed to me and was combined with my winning grey greens that emanated from pair 16 in the mid eighties which won Best Breeder at the B S and Best in Show at BW in 1988. To that, I have added super quality stock at great expense from Jo Mannes, Reinhard Molkentin and another line which has just started last season. If you hear such comments, would you be kind enough to ask them a question? The question to be put is simple. “Have you been to Gerald Binks’ aviary and seen for yourself? ” A lot of Scots have already made the trip and take a vastly different view. Think about a visit next year. My new website is now up and running which those with computers should find interesting as it includes among many headings my previous “Thoughts from Tanglewood” which seemed very popular when I wrote it in my magazine Budgerigar World. 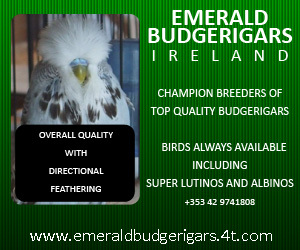 The web address is www.budgerigarworld.com. Finally, to all the Scottish societies and clubs, can I leave you with the suggestion you contact every local paper you can think of and promote the hobby as being one to get old and young alike interested in. People are getting fed up with watching a computer screen as well as TV. They want something more stimulating or as parents they want to get their growing children off the streets. Local papers will jump at the opportunity to fill their columns if they get articles about a “new” hobby people have not heard about. Remember I started at the age of 12. By 14 I was committed to the hobby and the satisfaction of ME breeding a GOOD one has never left me. I agree with your feeding regime Gerald and I also supply a multi-vitamin, Cytacon and Hormova, but instead of cod liver oil I add wheat germ oil to the seed during the breeding season. Touch wood the number of birds affected with french moult in my breeding room are almost zero. Biovit is supplied with added soaked droats , grated carrot and garlic powder. Gerald, I also do believe French Moult is a condition like the common cold and the Budgerigar is the most affected of the Pssiticine variety. 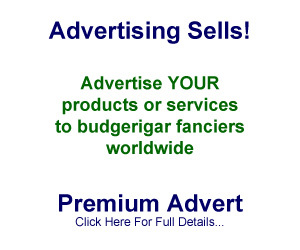 Many people believe a good budgerigar is fluked, but on visiting the top aviaries (and although myself have not been to many but know within no reasonable doubt) one will observe the quality of the special foods that are fed to their stud of birds. However, we all have problems with this infection and I have, over many years, learned that a lot of the products that are available for your birds may not be the right ones to bring the next successful generation of birds in your stud into fruition. I will in the near future send photo images of two siblings from the same parents but from different rounds, who then, as they came out of the nest and for 5 weeks after leaving the nest box, dropped their wing feathers and were just total wrecks within themselves. Another phenomenon is where they grow all the body feathers out and a complete set of new wing flights appears – also their temperament changed totally. I wonder if any others in the fraternity have experienced this? My first thoughts were PBFD but I am glad it is not that. My theory is it has to have been the lack of food with added protein being fed to them by their not so experienced parents. Each day I observe the feather that is linked being pushed out by another feather. The 18 years I have been breeding I have had this phenomenon happen only twice before. Then the cameras where not as good and also I thought it was a one off. I now have a before and an after photograph! One of the temperament displays of young birds with FM is they are very agitated when they are handled. One of these associations with these two young siblings while they where in the nest, is if touched in the wing feather flight areas they would be very agitated but they still had quality feathers and follicles to match. The only strange non standard feather behaviour with those that carry FM and with these two siblings, was that the appearance of rough dry feather was not apparent right up to even when they were shedding their feather. Please note: as soon as I observe the feathers where falling out, they were removed from the wings and tails and I have been doing this with FM’s over the years. I have experienced many times now what appears to be french moulters in the nest with their flights and tails dropping out….but within hours …only hours…..of this the new flight feathers and tail pins are right there behind them …it seems the new feathers are pushing out the old ones. I am experiencing it in a nest again right now and will take photos as its very clear whats occurring.